The Joint Task Force Operation DELTA SAFE (ODS), on Tuesday, assured the people of the Niger Delta region that its ongoing operations to fish out killers of its soldier in Delta State at the weekend was within its rules of engagement. The Civil Liberty Organisation (CLO) had, in a press statement, signed by its Chairman, Mr. Nengi James, condemned what it called military invasion of Niger Delta communities in Bayelsa and Delta states, accusing soldiers of arresting, harassing and molesting innocent citizens. 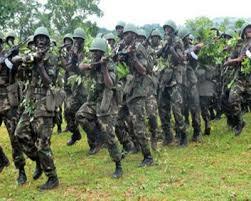 Investigations revealed that suspected militants had invaded a military base and killed a soldier on duty at Ogbugbagbene settlement, in Burutu Local Government Area of Delta State, carting away his rifle. Recently, after the attack on soldiers in Ondo State, the commander of the ODS, Rear Admiral Apochi Suleiman, had said the task force would no longer tolerate killing of soldiers, warning that anybody that harbours killers of soldiers would be dealt with accordingly. The coordinator Joint Media Campaign Centre (JMCC) Maj. Abubakar Abudullahi, who confirmed the killing of the soldier, dismissed reports that troops had invaded innocent residents. Meanwhile , the Ijaw Youth Council (IYC), has condemned the killing of a soldier on duty at Ogbugbagbene settlement, Burutu Local Government Area of Delta. President of the IYC, Mr Eric Omare, urged the military to exercise restraint in its bid to bring perpetrators to justice. Omare also urged the military to collaborate with community leaders to fish out those behind the act so as to protect innocent people. “We condemn in the strongest terms the gruesome murder of a soldier by unknown gunmen. The IYC states that the invasion, sporadic shooting and arrest of community leaders and members of the Delta and Bayelsa boundary communities is counterproductive. “The current hostilities meted out to settlements along the Forcados River are not the solution to the security challenge. Since the unfortunate murder, communities along the Forcados River such as Bomadi, Tuomo, Tamigbe, Toru-Ndoro, Bulu-Ndoro, Ogbugbagebne, Ojobo, Torugbene, Letugbene and other communities have been under heavy military siege.The movement of the people has been highly restricted and economic activities paralyzed,” Omare said.